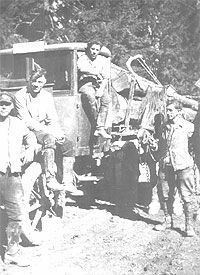 The company “Hubert Rütgers Langholz Transporte” (long timber transports) was founded by Hubert Rütgers in 1927. In 1957 Heinrich Rütgers and Elisabeth Rütgers took over the family company. The company’s move to the Industriestraße 44, 52224 Stolberg took place in 1981. An office, a garage, a washing plant as well as a stock of 1000 sqm was established. The Rütgers GmbH (Charter) was founded in 1991. Another milestone of the company’s history was the foundation of an office in Hemsbach (Baden-Württemberg) in 1994. In 2002 the stock in Stolberg was extended about 500 sqm to 1,500 sqm now. An additional garage including break testing was installed in Stolberg in 2005. In 2008 the business form was changed to Rütgers GmbH & Co. KG. With that change Hubert Rütgers, Katharina Rütgers-Nerlich and Karl-Heinz Rütgers were appointed as directors of the family company. All three have been working within the company for many years. Since 2015 four generations of Rütgers are working in the company.